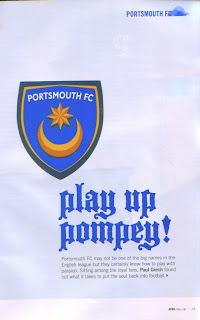 That of Portsmouth Football Club might not be one of the names that is immediately associated with English football. They don’t rank with the Manchester United, Liverpool or Arsenal as one of the game’s traditional giants, nor can they lay claim to a reputation built in recent decades like Nottingham Forest or Leeds. Yet there’s a lot to say in favour of Portsmouth FC. It is a friendly club for one which, in an era where money and finance have killed off the soul of the game, is not something to be taken lightly. They also play their games in a stadium – Fratton Park – that embodies a traditional English football ground, one that is surrounded by residential houses and pubs. Indeed, the sight of fans streaming along the roads towards the stadium as kick-off time approaches is one of the most fascinating during a brief trip designed around taking in a game between the home side and Aston Villa. This hasn’t been a good season for Portsmouth. An FA Cup win last year, a historic success that came after almost seventy years of waiting, as well as a good showing in the league gave rise to hope that bigger things were to come. Last summer’s arrival of England striker Peter Crouch for a club record fee of £11 million seemed to confirm their ambitions. Sadly, it hasn’t worked out as hoped. Charismatic manager Harry Redknapp was lured away by his boyhood heroes at Tottenham Hotspurs whilst key players in the form of Sulley Muntari, Lassana Diarra and Jermaine Defoe were sold off. Each one made the club a significant profit but the team suffered from their departure. So hope isn’t high on this particular evening, especially as Aston Villa are in the middle of a formidable run that has seen them break into the top four in the league. They might not say it, but they’ve come here to win. Football, of course, was meant to be played on a Saturday afternoon but there is something undeniably special about night games. Perhaps it is the floodlights or else the day spent thinking about the game that heighten expectation among the fans. And the fans truly rise to the occasion; at least they do on this day. With their club struggling, the bitter cold inviting them to stay at home and the economic crisis dictating that they limit their expenditure, they have every excuse to stay away. Instead, there’s hardly an empty seat. From the start, they set off with Pompey Chimes. There’s no need to worry if you’ve never heard this chant before because the words are fairly simply – play up Pompey, Pompey play up – and sung to the tune of Westminister Chimes. And if even that’s not enough, after a few minutes of constant singing by the home sides of the ground is bound to imprint it into your memory for years to come. Indeed, this song deserves more than a passing mention. The Chimes as a football song first got a mention in the Official Handbook of Portsmouth FC printed in 1900-01 making it the oldest football chant that there is. It certainly is catchy, which probably explains its longevity. It also has an impact on the players, and the boys in blue set off in determined fashion. Admittedly, their attacks aren’t the slickest but they put enough pressure to cause Villa serious problems. They, rather than their opposition, look like the team who is towards the top of the table. Then comes the sucker punch. Villa launch an attack, the ball falls to debutant Emile Heskey and his shot finds the back of the net. One nil to Villa. For a brief instant there is complete silence as everyone absorbs what they’ve just seen. Then the visiting fans burst to life, launching into a song heralding the name of their new hero. As for the rest, it takes a couple of seconds more to take in the sheer injustice that a game of football can dish out. Yet not even that last long because, sensing that their players are as deflated as they are, the fans launch once again into song. And that is the most impressive aspect of the whole evening. For the rest of the game, the Portsmouth players pile on the pressure as the ground, bar a corner filled with Villa fans, urges them on. Clearly, they deserve to take something out of this game and the players want to repay their fans. Yet the harder they try to less luck seems to smile on them. They are visibly frustrated by all this and eventually this gets to Nadir Belhadj who stupidly gets himself sent off. That practically kills Portsmouth’s hopes off, even though they keep pressing on. Soon the game is over and its nervous glances at the league table to asses just how they’re doing. It doesn’t look good and a relegation battle lies in wait. Even so, there’s not a single criticism for any of the players. Instead they’re cheered off the pitch, giving the impression that it is the home side that won. The players did their best and, even though that wasn’t good enough to guarantee a result, it is what the fans want to see. Because that’s what the game of football is about: passion. That is what drives the fans to keep on following their team irrespective of results, weather and finance. It is what people want to see from their players, perhaps even more than skill. And passion is clearly something which there’s an abundance of in Portsmouth. Which, above all else, makes this a special club. 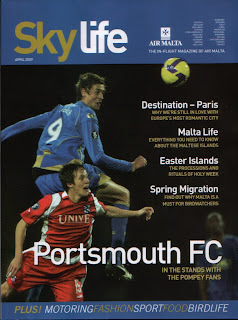 This trip was made possible courtesy of Air Malta and Portsmouth FC. Air Malta is the official flight partner of Portsmouth FC. This article first appeared in the April issue of Skylife magazine.